Exposure to a common visual illusion may enhance your ability to read fine print, according to new research from psychologists at the Universities of York and Glasgow. The team discovered that visual acuity—the ability to see fine detail—can be enhanced by an illusion known as the 'expanding motion aftereffect'. While under its spell, viewers can read letters that are too small for them to read normally. Visual acuity is normally thought to be dictated by the shape and condition of the eye but these new findings suggest that it may also be influenced by perceptual processes in the brain. Interest in the intersection between perception and reality led the research team from the Universities of York and Glasgow to wonder about visual illusions and how they might affect visual acuity. The expanding motion aftereffect can make objects appear larger than they really are and the scientists wanted to know whether this apparent increase in size could bring about the visual benefits associated with actual increases in size. In particular, could it make small letters easier to read? 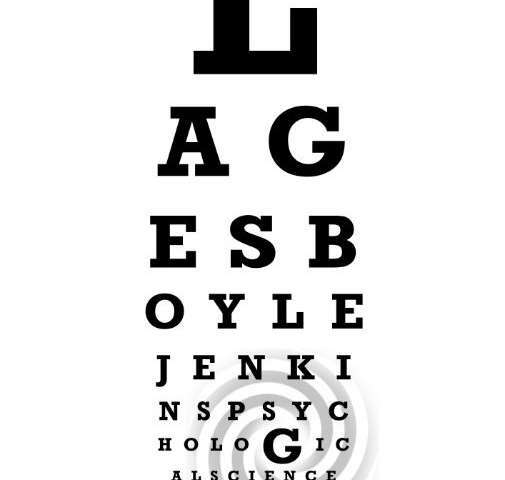 To find out, the researchers employed a tool that can be found in any optometrist's office: the classic logMAR eye chart. On this chart, letters are arranged in rows and the letters become increasingly smaller and more difficult to read as you move down the chart. Optometrists calculate visual acuity based on the size at which a person can no longer reliably identify the letters. In two related experiments, the researchers presented a total of 74 observers with a spiral pattern that rotated either clockwise or counterclockwise for 30 seconds followed by a set of letters, which participants were asked to identify. The font size of the letters became increasingly smaller over subsequent trials. The experiment revealed that participants' visual acuity differed depending on which spiral they saw. Participants who started with normal visual acuity and saw clockwise spirals—which induce adaptation to contracting motion and cause subsequent static images to appear as if they are expanding—showed improved visual acuity. That is, they were able to identify letters at smaller font sizes after exposure to the clockwise spiral. Those who saw counterclockwise spirals—which induce adaptation to expanding motion and cause later images to appear as if they are contracting—actually performed worse after exposure to the spirals. A third experiment, in which each participant saw both types of spirals over two sessions, showed similar results: Seeing clockwise spirals that induced an expanding motion aftereffect enabled participants to read letters at smaller font sizes. Co-author, Dr Rob Jenkins from the University of York's Department of Psychology, said: "We were pretty impressed by the consistency of the effect. No matter how you break it down—by letter size, by letter position—the performance boost is there." "And there was a correlation with initial ability: the harder people found the task, the more the illusion helped them." But don't throw out your eyeglasses just yet: the researchers note that the overall boost to visual acuity is small and fleeting. Nonetheless, this common visual illusion reveals a fundamental aspect of how we see, showing us that our ability to discriminate fine detail isn't solely governed by the optics of our eyes but can also be shaped by perceptual processes in the brain.